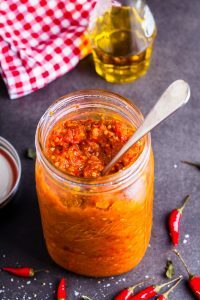 This week, we have a very firery, very delicious sauce recipe to share with you. It’s a deeply flavourful Home Made Peri-Peri Sauce, to have with your chicken, salads, sandwiches or steaks. You really should have this versatile jar of savoury deliciousness in the fridge at all times. Let’s roll our sleeves up and get started! 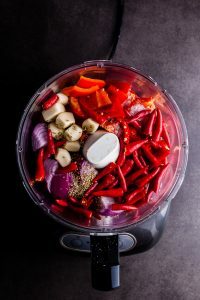 Combine all the ingredients in the bowl of a food processor/blender and mix until all the ingredients are finely chopped and the mixture is quite saucy. After 20 minutes, check the seasoning and adjust. The sauce should be well balanced with a good kick of spice and sourness from the lemon and vinegar. Pour into jars/bottles and keep in the refrigerator for up to 2 weeks. If you’d like to preserve this sauce, make sure your jars/bottles are well sterilized. Fill them to the top with the sauce and seal immediately. Recipe adapted from Simply Delicious.